Hughes & Mullins (active 1883-1910). Artist associated with 16 portraits. Alexander, Prince of Bulgaria (1857-1893), Army commander; son of Prince Alexander of Hesse and by Rhine. Sitter in 1 portrait. Alexandra, Empress of Russia (née Princess Alix of Hesse and by Rhine) (1872-1918), Consort of Nicholas II, Emperor of Russia; daughter of Princess Alice and granddaughter of Queen Victoria. Sitter in 18 portraits. Prince Francis Joseph of Battenberg (1861-1924), Son of Prince Alexander of Hesse and by Rhine and Countess Julia von Hauke. Sitter in 1 portrait. Prince Henry Maurice of Battenberg (1858-1896), Army officer and Governor of the Isle of Wight; husband of Princess Beatrice; son of Prince Alexander of Hesse. Sitter in 11 portraits. 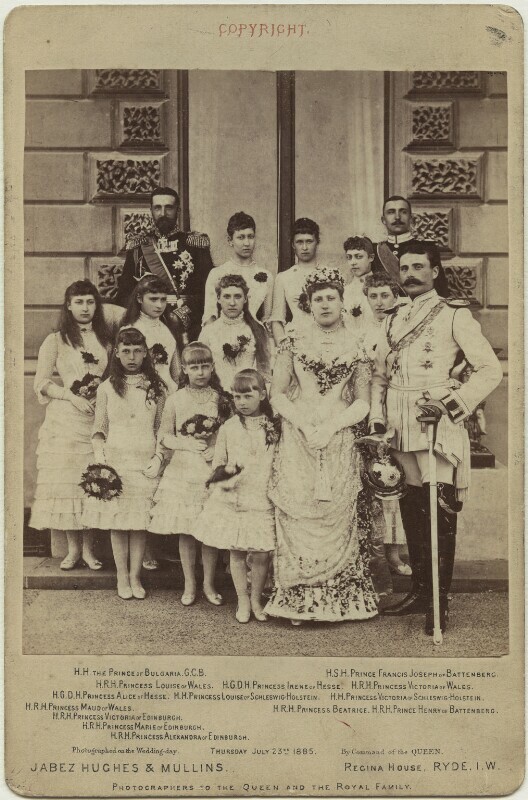 Irene of Hesse and by Rhine, Princess Henry of Prussia (1866-1953), Wife of Prince Heinrich of Prussia; daughter of Louis IV of Hesse-Darmstadt and by Rhine. Sitter in 9 portraits. Princess Marie Louise of Schleswig-Holstein (1872-1956), Patron of the arts and philanthropist; daughter of Prince Christian of Schleswig-Holstein and granddaughter of Queen Victoria. Sitter associated with 60 portraits.